Firstly, put the bones in iced water to remove the blood. Then place the bones, the oil, the crushed garlic and the chilli pepper in a vacuum bag, seal and cook in the SmartVide at 80 ºC (176ºF) for 45 minutes. Afterwards transfer the contents of the bag into a saucepan, add the flour and cover with the water. Bring the mixture to the boil, strain and blend with the help of a food processor. To finish add the spoonful of pesto and add salt to taste. Season the kokotxas lightly, then place them in a vacuum bag with the parsley sauce. Seal and set aside. Season the hake lightly, then place it in a vacuum bag with a splash of olive oil. Seal and set aside. Place the clams in a microwaveable dish and cling film very well. Set aside. For this recipe, first cook the bag with the fish in the SmartVide at 70º (158ºF) for 15 minutes. At the same time, cook the kokotxas in the SmartVide at 70 ºC (158ºF) for 12 minutes. Meanwhile, cook the clams in a microwave for 1 minute to open them. When the hake is ready, place it in the centre of a deep plate. 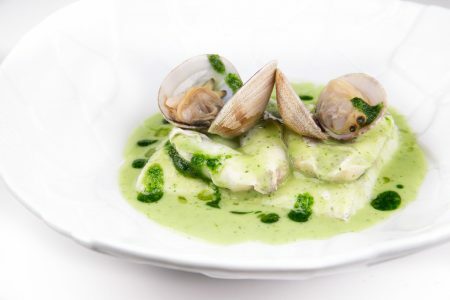 Then pour the kokotxas in parsley sauce over the fish and place the clams on top. Finish with a little parsley pesto and a dash of olive oil. Thanks to the sous-vide cooking in this recipe, you can achieve a superb texture both of the hake and the kokotxas. Furthermore, it allows you to cook down the fish bones and, in this way, really get the most collagen from them.